Tree experts from Lancaster City Council were called to Heysham High School this morning to dismantle and remove an old oak tree which had fallen on a portable cabin at the site. Storm Ophelia hit Morecambe and Lancaster with a vengeance toppling trees and sending trampolines flying. A tree was blown down on Oxcliffe road near St John Terrace and White Lund Road during Monday night. The stump of the tree could be seen on the side of the road, with the remainder of the tree in pieces on the other side of the road. Lancaster City Council workers were working this morning (Tuesday) to make a tree safe that had toppled over near Heysham High School during the storm. A spokesman for Lancaster City Council said: “The storm boards were put in place along Morecambe and Heysham Promenade yesterday (Monday)as a precautionary measure to prevent tidal overtopping which may have occurred due to the predicted high winds. “The meteorological situation will continue to be assessed by the city council although it is likely that the boards will be removed tomorrow (Wednesday). A trampoline came flying out of a garden towards a motorist in Morecambe on Monday, October 16. A motorist was shocked when high winds picked up a trampoline and blew it out of a garden towards her. 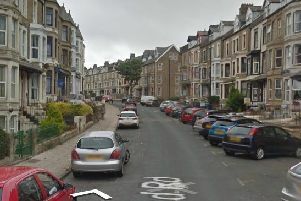 The incident happened at around 4.45pm on Monday near Lathom Avenue in Morecambe. “It wasn’t scary, more unexpected,” she said. “The wind just picked it up and it went over the wall and rolled down the road towards us. Engineers from Electricity North West restored supplies to more than 16,000 properties throughout the night following the Met Office’s yellow weather warning for severe gales of 60 to 65mph. Around 2,000 properties remained without power on Tuesday morning as flying debris hit power lines and high winds made access difficult for repair teams. Properties were affected mainly in the Lake District with 1,700 without power and 150 properties in Lancashire without power on Tuesday morning. Met Office have issued a yellow warning for wind between 6am and 3pm today, Tuesday, but the warning area has reduced for north west England, north west Wales, Northern Ireland and south west Scotland as winds are easing there. Photos of a twister on social media said to have been photographed in Morecambe on Monday are actually fake. The Visitor was sent copies of pictures of the twister but these are doctored images first released in 2012. The Mirror also featured pictures of the twister said to have appeared over Caton on Monday afternoon.